PS Vita version includes "mini episode visual novel." Eve: Rebirth Terror will launch for PlayStation 4 and PS Vita on April 25, 2019 in Japan, various retailer listings reveal. It will cost 8,000 yen on PlayStation 4 and 6,800 yen on PS Vita. A first-print limited edition that includes a special original illustration collection will also be available for 9,000 yen and 7,800 yen, respectively. Eve: Burst Error is popular game released in 1995 that was later ported to Sega Saturn. Eve: Rebirth Terror is the long-awaited sequel—the start of a new story set one year later. New Title, New Graphics – While Eve: Burst Error R is a remaster that kept its somewhat classic designs, coloring, and expression, Eve: Rebirth Terror is a new title that maintains the basic character image while transforming the design and coloring, introducing changing stand poses, blinking, and lip-syncing, creating an enhanced and more modern expression. Each event CG uses a new look, is beautifully colored, and represents a new Eve. A Fusion of Classic and New – Eve: Rebirth Terror properly portrays the character interaction and charm of the Eve series, depicted as a new title that maintains the taste of good old adventure games. System Enhancements – Eve: Rebirth Terror uses the series’ signature command system. However, rather than use a command itself for everything, usage has been narrowed down to necessary locations only, and has been adjusted to be able to progress with balance and without stress for smooth reading. Furthermore, in addition to the “Hint Mode” from Eve: Burst Error R, gameplay has been enhanced to be even smoother through things like the addition of an already-read function for commands that you have already gone through. Eve: Burst Error R Included with PlayStation 4 Version – The PlayStation 4 version of Eve: Rebirth Terror includes Eve: Burst Error R on the disc. It can be accessed from the in-game menu. It is not on a separate disc. 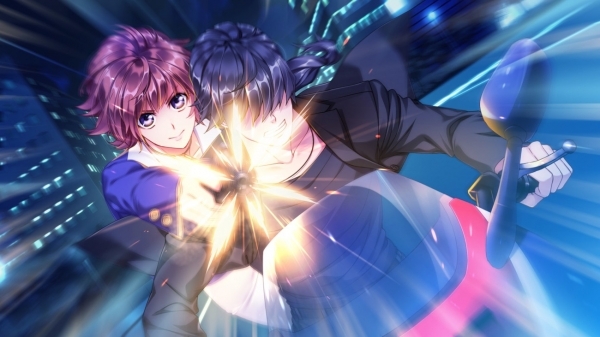 Mini Episode Visual Novel Included with PS Vita Version – The PS Vita version of Eve: Rebirth Terror a mini episode visual novel on the cartridge. It can be accessed from the in-game menu. It is not on a separate cartridge. If you missed it yesterday, read up on the game’s story here. Thanks, Rakuten (2, 3, 4) and @Renka_schedule.